International station, home to Eurostar and an exciting collection of shops, restaurants and bars, including Europe’s longest Champagne bar. Widely known for its Victorian architecture, the station is a Grade I listed building and stands between the British Library, Regent’s Canal and King’s Cross railway station, with whom it shares a London Underground station named Kings Cross St. Pancras. After escaping planned demolition in the 1960s, the complex was renovated and expanded from 2001 to 2007 at a cost of £800 million, culminating in a ceremony attended by Queen Elizabeth II and extensive publicity introducing it as a public space. A security-sealed terminal area was constructed for Eurostar services to continental Europe via High Speed 1 and the Channel Tunnel, with platforms for domestic trains to the north and south-east of England. The restored station has 15 platforms, a shopping centre, and a coach facility. 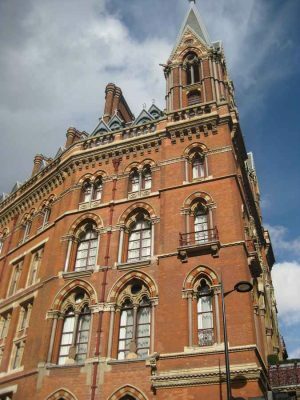 St Pancras is owned by London and Continental Railways (LCR) and is managed by Network Rail (High Speed), a subsidiary of Network Rail.